Dining tables typically serve multiple functions in the average household. Of course, many families gather around a table to eat their meals, but in many cases a table is also a place for children to complete their homework, as well as adults who need a surface to work on computer tasks, crafts or hobbies. When investing in the perfect dining table, it’s important to consider all the various roles a family will expect their dining table to fulfill, then select the one that is both beautiful and functional. The perfect table for a household is one that looks attractive while still serving all the various functions required by family members. Some families only use a dining table for special occasions and may only require a table that presents a “wow” factor designed to impress guests. Other families use their dining table multiple time throughout the day and want a table that is large enough to accommodate all their needs. Choosing the perfect table also involves selecting one that fits well within its surroundings. Round tables look great in a rounded alcove fitted with bay windows. Rectangular or oval tables are perfect for a setting where the room is long and perhaps somewhat narrow, or for those who love the idea of bench seating. A good-quality dining table is often viewed as a long term investment, so it’s a good idea to consider how a family’s dynamics may change over the years and how the buyer(s) want their investment to grow with them. A good table to consider is one takes up less space initially, but can be enlarged by adding one or more leaves for larger dinner parties or for additional people as a family’s size grows. It’s also important to consider quality when making a significant investment in a piece of furniture. Some tables might be trendy and also come with a trendy (expensive) price tag, but in a few years it doesn’t really serve family members well and it looks outdated. Investing in a classic, well-made piece known for its durability is often a better choice. 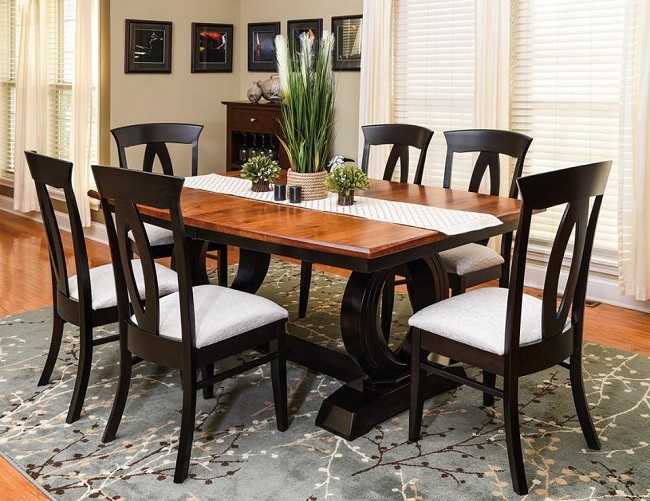 If you would like to know more about our expansive selection of Amish dining tables, please contact us!